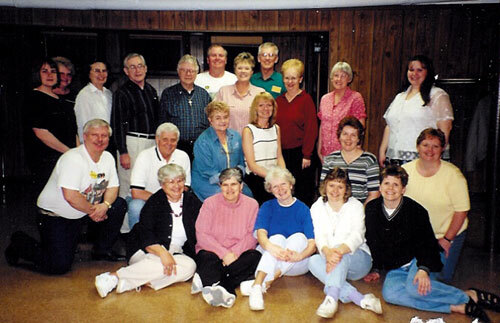 Two Fieldcrest Community Unit #6 Extra Support Professionals were recognized for excellence at the Illinois Education Association Region 14/Service Area M Excellence Awards banquet in Bloomington on April 26, 2002. Shirley Barth and Eva Keller were recipients of the ESP’s Excellence Awards. These awards are designed to recognize outstanding work in supporting education. Barth has worked thirty-one years, first in the M-D-R district and, after the consolidation, in the Fieldcrest district as a Teacher’s Aide. She will be retiring from her position at Fieldcrest Elementary South at the end of the 2001-2002 school year. Keller is the secretary for Fieldcrest Elementary South. She has been an employee of the M-D-R and Fieldcrest school districts for twenty years. Both ladies are great assets to the staff at South and very deserving of these awards. Ambulance Chief Rob Fredricks made a plea before the city council addressing the need for more volunteers for the ambulance squad. Fredricks indicated that there have been personnel problems on the squad and more volunteers are needed to accommodate the requirements of the squad. Especially needed are daytime volunteers. Fredricks said that the ambulance department will hold an open house on July 4 for those who are interested in joining the squad. Mayor Spencer also made an appeal for more volunteers and indicated that it is important that the city continues to receive adequate ambulance support. Plans are well under-way for this year's Fourth of July celebration. The theme for the parade is "A Time For Change". This is especially appropriate as the event transitions to its new locations at Sutton Park, and the downtown business district. The parade will prove to be exceptional this year, with the addition of first-time entries, including a Celtic, bagpipe marching band. Infrastructure is nearing completion at Sutton Park. Two, 200 amp electric service boards have been installed, and are awaiting hook-up by Commonwealth Edison. In addition, two street lamps have been added to the center section of the park, which will illuminate the area where the evening entertainment will be performed. The entertainment on the Fourth of July is Hoedown, a ten-member group that performs traditional and contemporary Opry style entertainment. The Fieldcrest music department will take over after the main event, to share some patriotic numbers, kicking off a spectacular array of fireworks. On Friday evening, an Elvis impersonator will arrive by limousine, and perform for two hours. Once again, Central Illinois Amusements will be providing the amusement rides and games. They have increased their show to include 13 rides. A carousal and Tilt-A-Whirl have just undergone extensive restoration, and will make their debut in Minonk. On Saturday, Jack Klendworth will host a Cruise-In. This will be held downtown, and two sections of Chestnut Street will be closed. Downtown businesses are encouraged to participate, as over 150 antique and custom cars will arrive for the evening. The beer tent will open on Wednesday July 3rd, and will run through Saturday night. Evening entertainment is planned, and includes popular area bands like Sister Groove, and Modern Cowboyz. This event will be held in the City Hall parking lot. Throughout the weekend, events will be conducted from Chestnut Street to Sutton Park. Old time games like pie eating contests and cakewalks will be held for young and old alike. Click here for a complete list of events. Also, look for a complete listing of events in the coming weeks at area local merchants. The Minonk area received up to 3 inches of rain in some areas this past weekend. Ponds of water were created in many of the farm fields. The corner of First and Chestnut Streets was flooded as usual. Spring planting is behind schedule due to the excessive amount of rain this spring. "Portraits" will be the theme for the spring concert that the Village-Aires will present on Saturday, May 18 at 7:00 p.m., with a second performance on Sunday, May 19 at 3:00 p.m. Both performances will take place at the Fieldcrest High School Gym. Tickets are $5.00 for adults if purchased ahead of time from a member of the group and $5.50 purchased at the door. Part of the proceeds will be used for scholarships for Fieldcrest youth who want to attend music camp. The "Portraits" theme is a celebration of life. Each song will portray a different time in life that we celebrate, such as birth, prom, graduation, military, vacations, engagements, wedding, family, and anniversaries. The Village-Aires will be celebrating the various "Portraits" in life through songs. Prom night is portrayed by "Footloose" and graduation with "I Hope You Dance." The men's quartet will sing "You Are So Beautiful" and the women's chorus will sing "Diamonds Are a Girl's Best Friend" as they portray the engagement time of life. The men's chorus will see that we have fun on vacation as they sing "Sea Cruise." The kids will help us have fun on our vacation as they sing "Mickey Mouse Club March." The Village-Aires will come together to sing "I'll Be There" as a wedding is portrayed and will celebrate anniversaries as they sing "As Time Goes By." The Village-Aires members are: Judy Bennington, Pam Gansch-Boythe, Teresa Cirks, Dawn Geringer, Tracy Healy, Loretta Hunt, Melissa Knapp, Vickie Missey, Sirley Missey, Nancy Redenius, Tiffany Bennington, Debby Cargill, Lynn Cunningham, Janet Ioerger, Joan Jochums, Marylu Pille, Eunice Reinhardt, Marcia Stolt, Gary Cunningham, Howard Harms, Mike Isham, Jack Jochums, Jay Jochums, Ron Friese, George Hunt, Ron Redenius, and Jerry Welch. The director and accompanist is Elaine Cunningham. Jack Jochums is the program director. Click here for a picture of the Village-Aires. Thirteen people showed up Saturday morning to walk the streets of Minonk and pick up the litter accumulated from over the winter. The streets appeared to be much cleaner than last September when the last street cleaning was done. It is hoped that residents continue to help keep the city streets clean of litter. Those helping to clean the streets were Mark Spencer, Mr. and Mrs. Trent Smith, Bob Hakes, Jack Jochums, Charlie McGuire, Michael Stagliano, Dave Uphoff, John Hawk, Daniel Hawk and friend Nate ? ?, and Virginia Hawk. For more pictures of the cleanup, click here. The Fieldcrest Board of Education hired a principal for Fieldcrest High School to replace Don Achelpohl who resigned this spring to take another job. The board unaminously agreed to hire Steve Wallick per pending contract. Wallick is currently high school principal at Pearl City CUSD # 200. Pearl City, IL (Freeport). He has nine years of secondary experience. He has a M.Ed in Counseling Psychology from Wayne State College, Nebraska and a specialist degree in Educational administration from the University of Nebraska, Lincoln Nebraska. Appointed Jeanette Peifer as Middle West Language Arts teacher. Appointed Danielle Smith as full-time certified aide at Elementary South. Appointed Jon Kilgore as Elementary-Middle School East Principal as per pending contract. He is currently teaching at U High in Bloomington. Accepted the resignation of Sarah J. Hatfield as High School Science instructor. Accepted the resignation of Judy Kalkwarf as head girls' golf coach. Appointed Cindy Uphoff as 6th, 7th and 8th grade Middle School West Math instructor. Appointed Howard Harms as full-time (8 hours) Custodian I. In other news, the board agreed to pilot biodeisel fuel from Evergreen FS for the remainder of the 2001-2002 school year for a price of approximately $50-75. Fuel will be rebid in the next fiscal year. And to purchase fuel tanks for $6174.60 which reflects a rebate of $765.40. Evergreen asked permission to promote the fuel as well as District 6 though the media similar to other area school districts. The board accepted the Castle Service Corporation bid of $26,017 to furnish labor and materials to install one (1) Gordon Piatt boiler burner model FL14.9-G-30 with 3" H gas train, front, plate which includes replacement of required controls to meet code and all related wiring. Andreas Paloumpis, a Minonk native, received The Distinguished Alumni Award for 2002 from Illinois State University. The award recognizes the exceptional achievements of Illinois State alumni and is the highest honor presented by the Alumni Association. Recipients have demonstrated outstanding performance in their profession and have made outstanding contributions to the community, state, or nation. Paloumpis, a 1943 graduate of Minonk Community High School, graduated from ISU in 1950 with a degree in Secondary Education and received a Master of Science in Biological Sciences from ISU in 1953. He was a professor of zoology and fisheries at Illinois State early in his career. He served as president of Hillsborough Community College, Tampa Florida, for 14 years and led the institution into a prominent position in the local and statewide educational system. In 2000 he came out of retirement to serve as interim president of Luzerne Community College, Nanticoke, Pennsylvania. Paloumpis also served as founding president of Winston Church College formerly in Pontiac and president of Onondaga Community College in Syracuse, New York. Memorial Day services were held on Monday, May 27 at the Fieldcrest High School gymnasium. American Legion Commander Melvin Matter was the master of ceremonies for the event. The services began with a prayer by Father Don Henderson of St. Patrick's Church. Speeches were then made by the Fieldcrest winners of the VFW Citizenship Contest. Marcia Backstrom emphasized the importance of reminding people of the origins of Memorial Day and why we celebrate it each year. Andrew Glowacki stated that the real heroes in our country are not Michael Jordan and other celebrities but rather the men and women who have died for our country. Elaine Cunningham performed "Amazing Grace" on the bagpipes. That was followed by a reading of all of the veterans from Minonk who have passed away. The readings were given by Garmer Kleen and Bob White. A speech and prayer was given by Reverend Dan Gansch-Boythe of St. Paul's United Church of Christ. Then he played the piano to accompany his wife Pam as she sang "God Bless America". The program concluded with the presenting of colors by the local color guard. On Wednesday volunteers placed 433 flags on the graves of veterans. 316 flags were placed in the Minonk Township Cemetery and 117 flags were placed in St. Patrick's Cemetery. For pictures of the Memorial Day services, click here.